I was first inspired to make this dish by a friend on Facebook – someone I had gone to school with for many years, but had lost touch with. She posted a comment about her love for Mansaf, and I just couldn’t help but ask her for a recipe. The main challenge is finding an ingredient called ‘jameed‘, a dried and hardened yogurt. I didn’t find it in its usual form – I could only find it in a ‘ready to use’ format. Good enough. I had never had the real thing before, so I don’t really know whether it tasted different. If anyone knows where you can get Jordanian food in Toronto, I would love to try Mansaf made by people who know how it should taste!! Let me tell you about the jameed. I knew it would be an interesting flavour, being dried yogurt, but I wasn’t quite prepared. It has a very rich smell and flavour, almost like a blue cheese (for lack of a better comparison). I wasn’t worried that it was off – I had read enough to know that jameed – and Mansaf – have a bit of a stink to them. To get a real sense of what I mean, please read this blog post by Toronto hip hop artist, Arabesque. His childhood embarrassment at the hands of Mansaf says it all. I was a little worried that J wouldn’t like it. I really shouldn’t have worried. The jameed mellowed out with cooking, and meshed well with the lamb flavour. Amazing! Of course, I had to add some spices to it. 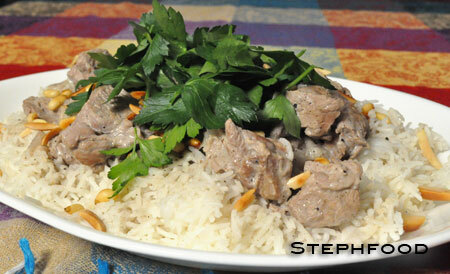 Not all Mansaf recipes I found called for spices, and some called for more than others. I decided to use spices that I found repeatedly in recipes, and made an Arabic Levant baharat (spice blend) to use. You know, any excuse to use a new spice blend and play with my spices. This is a really hard dish to describe. The sauce has a very bold flavour, but mellowed out after stewing the lamb. On top, you sprinkle fried/toasted pine nuts and almonds, which give a crunch and nuttiness (duh!). Add to that a pile of fresh parsley, adding a little bite and some brightness. Together, it is an amazing blend of flavours and textures. Serve this dish family style on top of a nice Arabic flatbread, if you can get it. I couldn’t find any. Also, the more traditional recipes call for much larger pieces of lamb, with the bone in, and often the lamb head. I chose to use cubed lamb instead, because that’s what I like. I want to officially put Jordan on my list of places I need to go. I want to go to Petra. I want to eat all of their Mansaf, and bring home some real jameed. This dish was incredible, and very different from other things I make. It was very easy to make, and the jameed was the only required ingredient that was tricky to find. I would have liked to find the right Arabic flatbread to serve with it… I had quite a bit of the “broth” left afterward, so I ate it on noodles, with a bit of plain yogurt added. So delicious! based on this recipe, this recipe and others. In a large, heavy-bottomed pot, heat 1 teaspoon olive oil over medium-high heat. Add the chopped onion and lamb, and sear the meat on all sides. Turn the heat down to medium and simmer for 10-15 minutes. Meanwhile, put the rice into a large bowl and add enough warm water to cover 1 inch above the rice. Soak rice for at least 15 minutes, and for as long as 1 hour. In a blender, blend jameed with 1 cup of water. Add the jameed mixture to the lamb, stir well. Add saffron and baharat (spice blend), stir well. Bring to the boil, then turn heat down to medium, cover, and simmer for about 20 minutes. Meanwhile, prepare the rice by rinsing well. Melt ghee over medium heat in a separate pot, toast the rice and coat well. Add 1 1/4 cups water, add a pinch of salt, bring to the boil, then turn down to medium-low and cook for 20 minutes. Check on the lamb – if it still needs some cooking, bring back up to the boil, then turn back down to low and cook for another 15 minutes. Fry almonds and pine nuts in a little bit of oil or butter until golden. 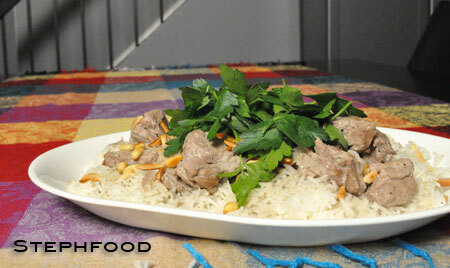 To serve: place rice on top of layers of flat bread (if using) on a large platter. Arrange meat pieces on top, decorate with fried nuts. Gently spoon some of the jameed broth over top. Top with lots of fresh parsley. Grind peppercorns, cardamom and allspice together and mix with grated cinnamon and nutmeg.